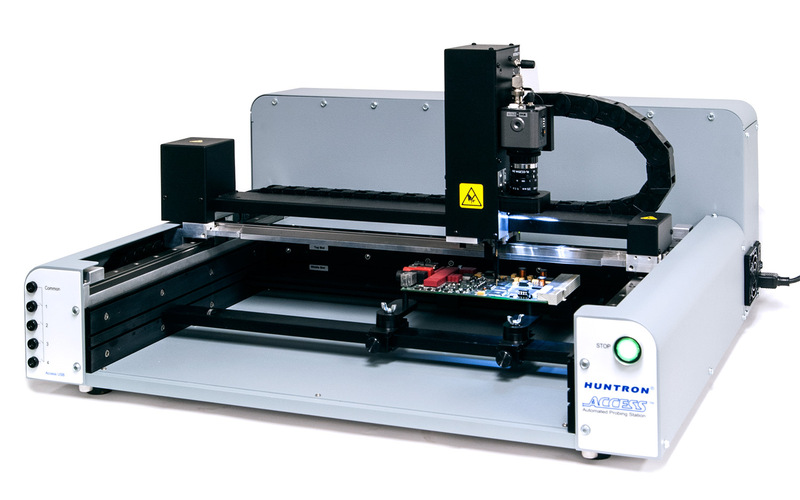 The Huntron Access Prober is used to automate the testing of printed circuits assemblies (PCA) that would otherwise have to be tested by hand. Adding Flying Probe Tester to your analysis procedure will significantly decrease test times therefore increasing productivity. The Access Prober is designed to accurately access test points on small to medium sized PCAs. The exceptional accuracy achieved by micro-stepping and linear encoding ensures reliable probing of the smallest surface mounted components. By using either the standard built-in test probe or a custom test probe, the Huntron Access Probers add flying probe tester technology to your new or existing equipment. The high-resolution color camera ensures correct probe placement and provides a clear view of the PCA under test. Buy Now from Shop Huntron? Q: What are the primary differences between the Access and the Access 2? A: The main difference is size. The Access Prober is sized for small to medium dimension PCBs while the Access 2 Prober can handle larger PCBs. 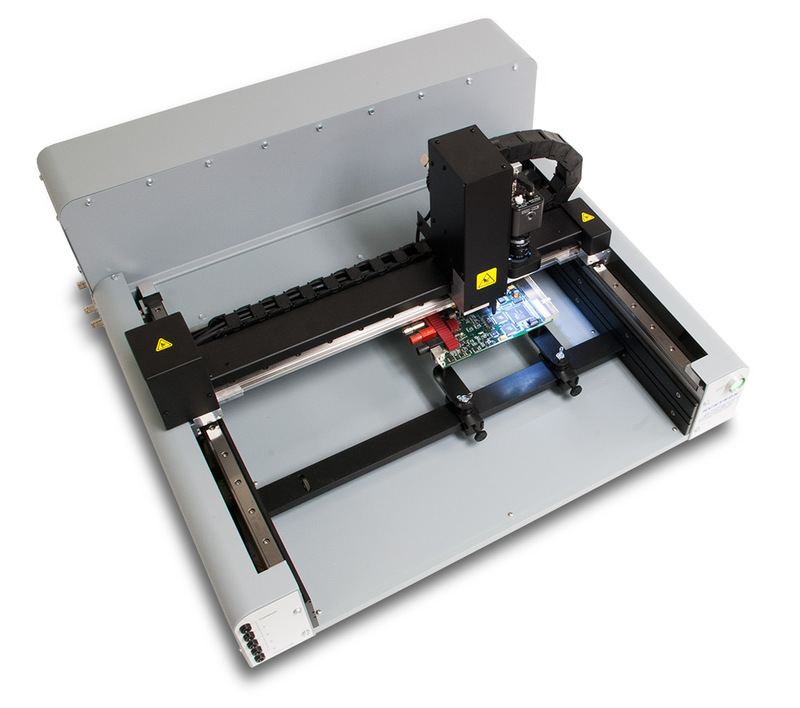 The Access 2 has additional vertical space to handle taller features on a PCB. See the Compare Prober Specifications chart for the actual dimensions. Q: What types of test hardware can be connected to an Access Prober? A: The Huntron Workstation software supports Huntron Trackers (Tracker Model 30 and Tracker 3200S) and selected conventional test instruments (see the Workstation Software page for a list). Other test instrumentation can be connected to an Access Prober and controlled using Huntron Remote Control or custom applications developed using the Hardware SDK. Q: How fast is the Access Prober? A: The probing speed depends on how the Prober is being used. If it is being used to take measurements, the speed in affected by how long it takes to capture the measurement. In general, you will be able to probe about two seconds per point. Q: How accurate is the Access Prober? A: Huntron Access Probers are very accurate. The minimum step resolution is 10 microns with an accuracy of +/- 20 microns. This is more than accurate enough to probe very small lead spaced devices such as the 0.4mm surface mounted ICs. Q: Can I use CAD data to develop a test routine? A: Yes. Optional software is available to assist you in using your CAD data to create tests in Huntron Workstation. You can find more details by visiting the Workstation Software page. Q: How does the Rotating PCA Support system work? A: Included with the Access Prober is a combination of slide bars, movable arms and pins that allow you to mount the PCB under test using the board's mounting holes. We refer to these parts as the Huntron Board Holder Kit. Rather than trying to explain the details here, take a look at the Huntron Board Holder Kit instruction sheet.